Terminalia intermedia Bertero ex Spreng. Terminalia subcordata Humb. & Bonpl. ex Willd. Terminalia catappa is a large tropical tree in the leadwood tree family, Combretaceae, that grows mainly in the tropical regions of Asia, Africa, and Australia. 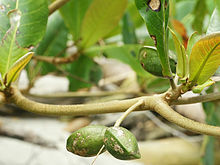 It is known by the English common names country-almond, Indian-almond, Malabar-almond, sea-almond, tropical-almond and false kamani.